Looking colourful in the morning sun as she sails from Hunsterston, the Panamanian-flagged bulk carrier BARILOCHE, dating from 2007, was sailing for Ventspils in Latvia to pick up her next cargo of coal. 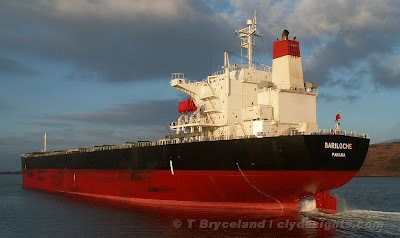 Japanese built and owned, she is 225 metres in length, and has a deadweight of some 75,395 tonnes. She was recently reported (in January) as being on charter at a daily rate of US$35,000 although the charter on which she was embarking was for considerably less, at around half that rate according to this site.